Insect Darts - "Insect Darts I"
The latest from Michael J. Bowman is a duo project with Mark Garro on saxophone, bass, and vocals, and MJB on guitars, drums, and casio. I love getting music from hometapers. The fun is that you never know what to expect. They can be counted on for a variety of music on their own, and when they team up with others anything can happen. 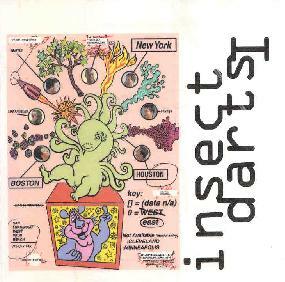 On Insect Darts, Bowman and Garro have created a freaked out space-jazzy, experimental, melodic noisefest of tunes that follow an urban theme... that theme being identified by the fact that all eleven tracks are titled by major American cities. Chicago, San Francisco, New York, Boston, you get the idea. Among the highlight tracks is "Minneapolis", a space jazz jam that alternates with synth/sax freakout moments. It's dark, noisy, and a bit chaotic, but the cool lounge jazzy bits keep a sense of groove and melody to the proceedings. "Houston" features a spoken word rant by Garro against a backdrop that is sometimes ear-splitting, sometimes industrial, but tempered by a bouncy playful synth line. A wild combination of sounds and emotions. "Cleveland" is a bouncy rhythmic rockin' space freakout. The duo lay down a steady boppin' groove that lays the base for some cool synth explorations. The rhythm section has an almost punkish feel to it that gives a welcome edge to the music. "Memphis" spotlights Garro's scariest vocals and screeching sax against an intense organ and drum background that is simultaneously majestic and disturbed. And "Chicago" is jarringly laid back after enduring "Memphis". An ethereal stroll through a jazzy, but psychedelic park. In summary, we've got a cool set of space jazz jams here that fans of the cosmically chaotic will enjoy. I recall comparing a track from MJB's Cloud project to Soft Machine and indeed much of this album brings to mind a raw, New Wave, Punk, or Post-Rock version of the Softs. For more information you can visit the Semperlofi web site. Contact via snail mail c/o MJB; 11 Orchard St; Cold Spring, NY 10516. CLICK HERE to read the reviews of MJB's Cloud project that have appeared in Aural Innovations.